What do most people do when their foot starts to hurt after running? They go see their doctor and most of time they're told any number of things from they need a new pair of shoes, their form is bad, they need orthotics and maybe even that they, and all humans just aren't made to run. That's precisely what happened to Chris McDougall and rather than take his doctors' (both of them) word for it, he set off on an epic journey to discover if man really was meant to run, especially when both doctors had just told him that he just was not meant to run (he's a big lad, like me). 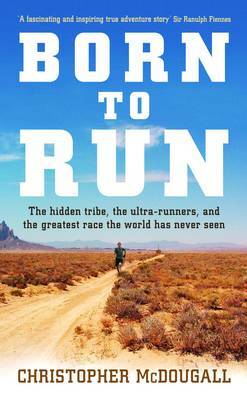 The whole book evolves around the build up to a race between a random group of America's best ultra runners and the Tarahumara tribe - reputed to be the best long distance runners in the world who literally wear pieces of rubber strapped to the bottom of their feet - in the Copper Canyons of Mexico. It's a great and inspirational read that includes a lot of very useful information worth pondering and considering, especially the notion of whether we really should be buying the latest and greatest shoes, or sticking with plain and simple one like those used before Nike invented the modern running shoe and those used by primitive tribes like the Tarahumara. I've just finished reading this book, and whilst Amazon.com provides quite a good review of the book, I think the best way to get a feel for this book is by reading the first few paragraphs of chapter two. Thanks to Amazon's Look-inside feature you can do just that. There's also quite an interesting Q&A with the author on the Amazon.com page if you're interested. Oh, and you may recognise the name - Chris McDougall - he's written several articles for Runner's World on the Tarahumara along with the article I recently linked to about the perils of wearing shoes (parts of the article are actually in this book too).